If you were to receive a diagnosis for high blood pressure, you wouldnt think twice about heeding your doctors advice to change your diet, increase physical activity, and take necessary medications. Would this be true if you received a diagnosis for a mental health condition? In the US, only 1 of 3 persons who need mental health services actually receive care. With mental illness as the leading cause of disability worldwide, it is imperative that we take action to increase awareness, improve access and quality care, and develop the appropriate policies and laws to support mental health. October 10 marks World Mental Health Day, where the theme of Dignity in Mental Health aims to tackle one of the major challenges in care: stigma. Even though research proves otherwise, those with a mental health condition are sometimes portrayed in the media as weak, inferior, or even dangerous. These misconceptions prevent patients from seeking necessary treatment and can lead to feelings of shame and isolation. This years campaign includes raising awareness to ensure that those with mental health conditions can continue to live with dignity, through human rights oriented policy and law, training of health professionals, respect for informed consent to treatment, inclusion in decision-making processes, and public information campaigns. Whether were talking about depression, addiction, autism, or schizophrenia, we can all take part in breaking down the stigma around mental health. So what can we do? As individuals, we can get to know the facts, be mindful of our language, and simply speak more candidly about mental health issues. In doing so, we can create an environment that promotes mental health and treatment-seeking behaviors. Employers can and should play a pivotal role as well. 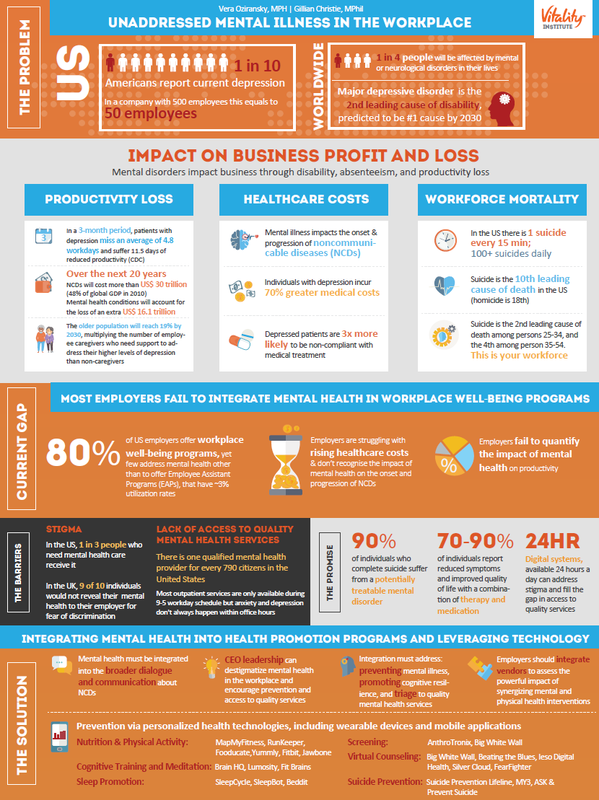 An estimated $80-100 billion is lost each year due to mental illness (see infographic below), but this can be mitigated by promoting cognitive resilience, integrating robust health and well-being programs, and providing mental health coverage. Tech companies and startups are getting involved as well by developing apps to facilitate personalized strategies to promote brain health. Apps like Lumosity and Cognifit help keep our brain active by generating fun and engaging brain-teasers. Others, such as Memotext and My Drink Aware help facilitate medication adherence and provide on-the-spot counseling services, respectively. Technology can help reduce cost and expand access to care. Advocacy groups in the US, UK, Australia, and Singapore are also doing their share, providing platforms for people to engage openly in dialogue on mental health issue and share resources on treatment and care. Working collaboratively, we can help break down the barriers to care and promote an environment of brain health and overall well-being. One wouldnt question getting help for hypertension, so why should mental health be any different?